As I sit here waiting for our boat to be built, one of the big decisions I have to make involves electronics. Not just the brand that we will ultimately choose but also what equipment. Now I'm trying to decide if we should have a fish finder or some kind of side scan/ forward looking sonar on the list. I suppose the fact that I have not fished since I was 16 years old should be mentioned. I do sometimes think that I might like to take up fishing but so far I haven't been interested enough to try. Part of the reason was that I really did not want to clean fish in our teak floored cockpit as we sailed. I suppose it will be different now on the tug...? So, is a fish finder actually helpful on a trawler for anything other than fishing? Do I simply continue on living without it in blissful ignorance? I don't find them helpful even for fishing. Very useful even on a non fishing trawler. It shows the type of bottom (soft mud, tall weeds, rock, etc), and also paints a picture of bottom contours. A quickly undulating bottom calls for caution in case it undulates up to near the surface. However, we also have a second depth sounder that only gives a digital readout as a backup. But I don't think I'd bother with forward looking sonar unless you just have to have all the bells and whistles. And side scan is really only handy for fishing or diving where you are scouting for schools of fish or stuff to fish or dive on. Ok, so there is some benefit to having a fish finder. Is CHIRP technolodgy worth having then? My understanding is that it offers better resolution... Is it that simple? I'll chime in supporting a fish finder for cruising as opposed to fishing. Being able to get a sens of the bottom contour and makeup is very useful, I think. I don't think I'd spend any more $$ to get chirp, at least not for cruising. If you were seriously into fishing, then maybe. But a good, regular fish finder will do wonders. I've got a little Furuno FCV627, now replaced by the nearly identical FCV628. It was $600 very well spent, I think, and doesn't lock you into any brand MFD which I really like. For basic bottom reading you don't need CHIRP. But if there is little difference in the price between a CHITP transducer and a standard one for the unit you're getting I'd get the CHIRP. Well, I will call them and see if they have a good dealer locally. I'd have to disagree regarding the sidescan. We don't have it on our current boat but have previously and found it very handy for lots of things not least of which was checking an anchorage for obstructions prior to dropping the pick. Do one 360 turn with the sidescan on and you can see any obstructions in a fairly large area. Getting a detailed image like that is worth it. I was thinking the OP was talking about a basic fish finder to use to see the depth of the water. Spending the money so you can get a detailed picture of the bottom is well worth it. Since I'm too dumb to post pictures, I'll post a link. Those I feel are useless. A standard color fish finder from Furuno or Garmin No side scan or forward scan or chirp is needed. Better if it also is GPS combo as a backup to the main chart plotter. The smaller display draws less current to be used as an anchor watch. 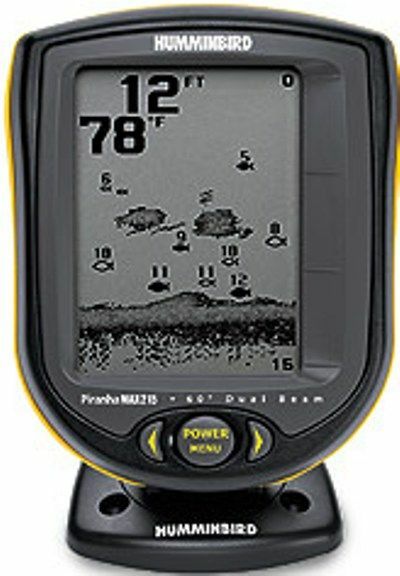 Well the best quality/feature fish finder you like will be more than adequate. That said I installed the $119 Humminbird that the previous owner had in the boat when I bought it. It was still in the package actually. Nice and small it fits on the upper helm where I run the boat 100% of the time. I have been thousands of miles and have never (knock on teak) hit bottom.I have grown to trust it absolutely. So....cheap or expensive they all work! My understanding is that the so-called structure scan side sounded are only good up to maybe 100' then they lose it. Maybe some who has one can confirm. I tried one once and couldn't get it to work at all so replaced it with a Furuno which worked perfectly. Anyway, if you want depth and contour readings below 100', forget about structure scan. Got a "fish finder" based on the boat-builder's (who has extensively sailed here) recommendation to provide a substantial display since shallow waters are so common here. Tiny digits aren't enough. And I'm not a fisherman! I like mine a lot and mine is over 10 years old. It gives a running account of the depth, rugged or smooth, getting deeper or shallower and at what rate is the depth changing. I use the fish finder most when scoping out an anchorage. Going around in decending radius circles. Soon I know where all the shallow spots are, where the rocks are or logs ect. I also have a $700 Raymarine digital sounder but I was supprised to find how useful the silly little $100 fish finder would be. I'll throw in my vote for the "useful even if you don't fish" view. There are great and expert discussions on The Hull Truth marine electronic forum by serious fishermen on the pros and cons of the various technologies. I also cast a strong vote for having a second freestanding depth gauge with it's transducer on the other side of the boat. The transducer is the very critical piece of the system. We have a Simrad Structurescan on Blue Sky; not sure what version but it was installed new in 2013. On the high definition setting (800 kHz) it will read to about 150` while on the lower definition setting (455 kHz) it will read to about 350`. When the thing is working it produces an incredible view of the bottom. It has the side scan which I never use, which is a personal preference. The downscan is far more understandable. However, the system is very flakey and so cannot be relied on for much. It is okay for entertainment (looking at wrecks etc.) but even at that it usually craps out just when I`ve got some interested visitors eagerly anticipating a view of something on the bottom. "Entertaining" seems to be the operative word.